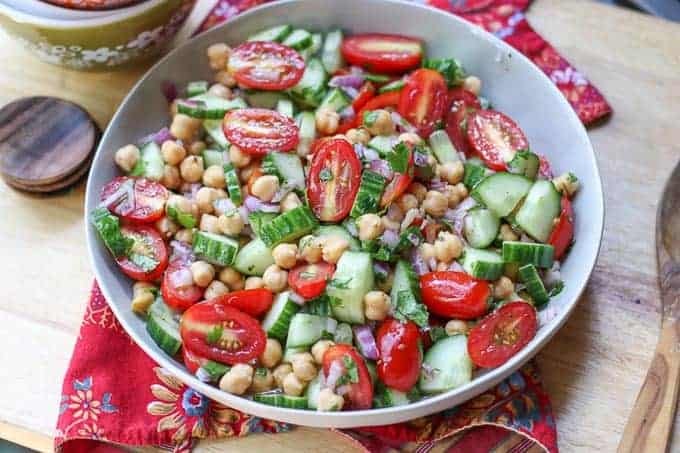 This simple chickpea salad combines chickpeas, cucumbers, tomatoes, onion, and cilantro for a flavorful combination. 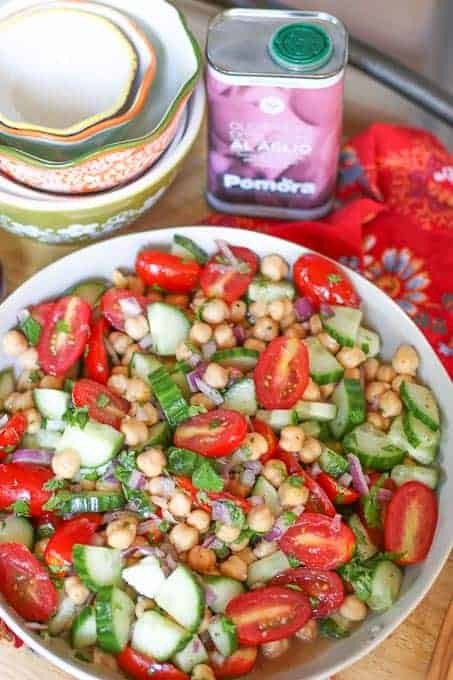 Make this gluten free chickpea salad for a side dish, a pita sandwich filling, or a healthy meal. This post contains affiliate links. 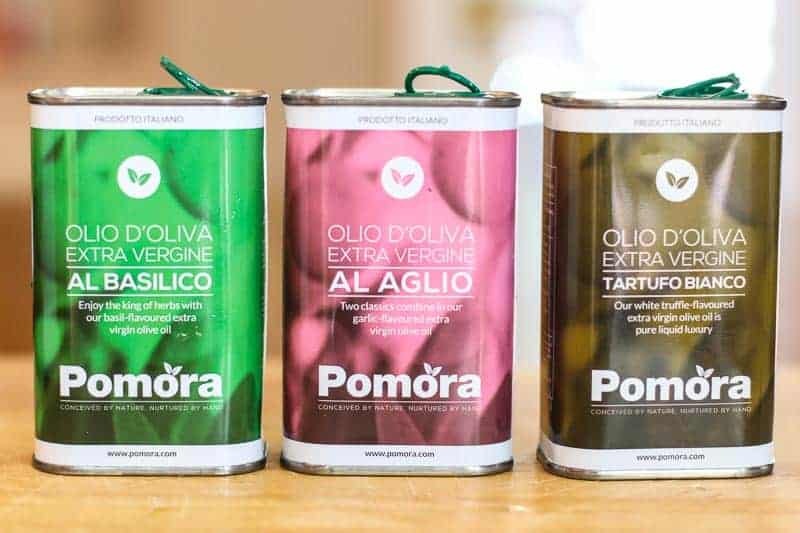 I have partnered with Pomora Olive Oil. They send me quarterly batch of their newest olive oils in exchange for a post. I receive a small compensation from any olive oil orders at no additional cost to you. The colors in this simple chickpea salad are eye candy. It looks so pretty in a platter or on a plate. The flavors are a winning combination also! One key ingredient in this salad is a good quality olive oil. I use Pomora Olive Oil for it’s quality and richness. This salad is very simple, therefore the olive oil will really stand out. I just received my infused basil, garlic, and white truffle olive oils from Pomora and I couldn’t wait to make something special with them. The infusions are very light and not overpowering. The flavors taste fresh and vibrant. I absolute love everyone of them. I have used the garlic olive oil in my Italian Marinated Mushrooms recipe. 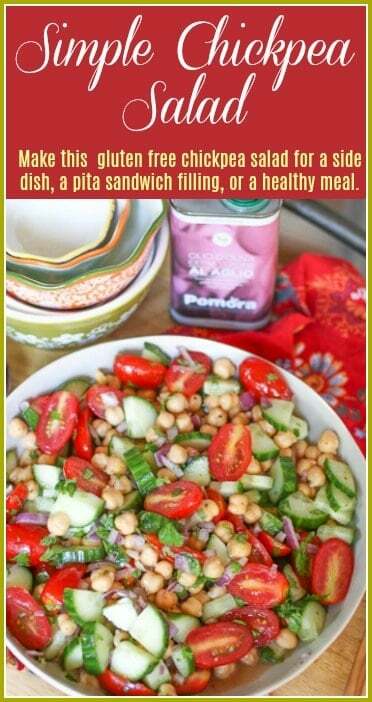 It thought it would be great in this simple chickpea salad also. Do you have to cook chickpeas for a salad? The beauty of this simple chickpea salad is how easy it is to create. You can make it in 5 minutes if you want. I use canned chickpeas so that they are cooked and ready to be served. You just drain them from the can and rinse them. Canned chickpeas absorb the flavors of the lemon and garlic infused olive oil perfectly. If you want to use dried chickpeas, here is a great resource on how to make them three different ways. What if you don’t have garlic infused olive oil on hand for the recipe? If you don’t have garlic infused olive oil, no worries. Just add two crushed garlic cloves and substitute garlic infused olive oil with the plain Pomora olive oil. You can make this simple chickpea salad in advance. It will still taste fresh up to 4 days in the fridge. I also add a little cayenne pepper to add a little spice. If you do not like spicy foods, you can omit this ingredient. For more recipes with the delicious Pomora Olive Oil, check out: Blueberry Burrata Salad, Greek Lemon Potatoes, and Jalapeno Chimichurri Sauce. It is best to refrigerate an hour or more before serving, however, you can serve immediately. If you do not have a garlic infused olive oil, use same amount of plain olive oil and add 2 crushed garlic cloves. 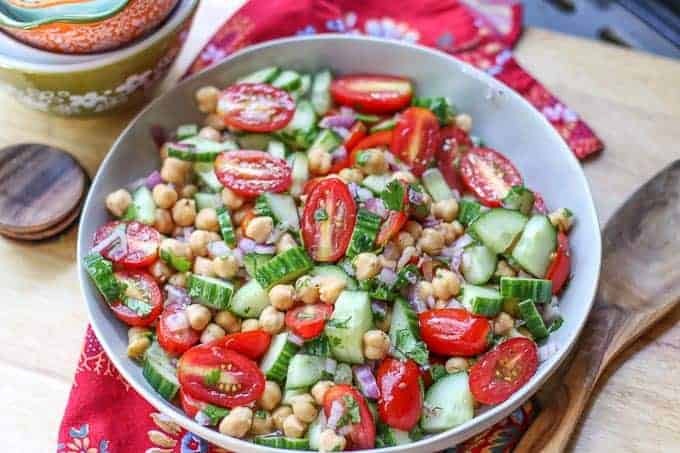 I love chickpea salads and can’t wait to try yours! That olive oil looks divine too. Good olive oil is so important to a tasty salad.